Virtually any pilot or member of a flight crew will tell you that 21 water ditching incidents since 1952 is 21 times too many; but as extremely rare as the possibility may be, it still could happen — and this article gives you information which just might save your life in the unlikely event that you are involved in a water ditching of a commercial aircraft. 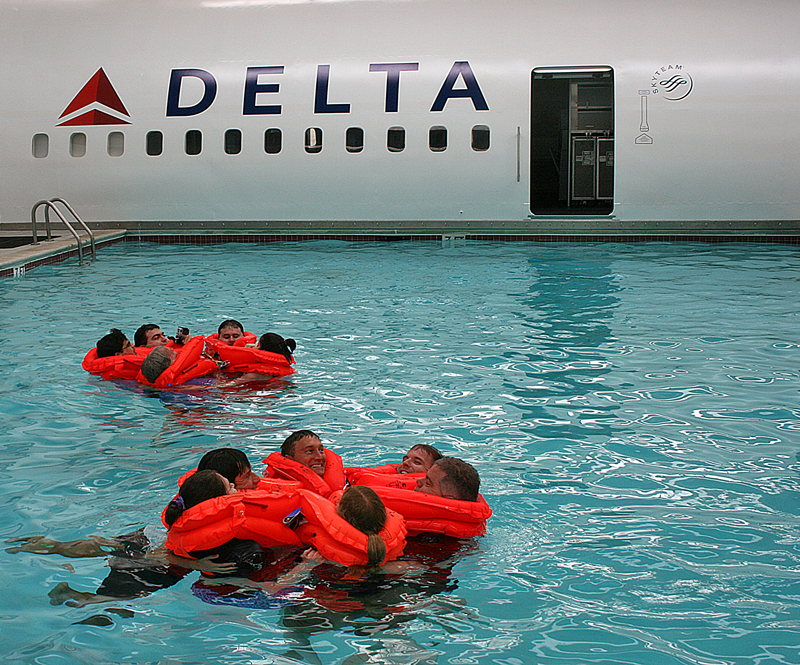 Participants who were fortunate enough to attend the Road Warrior Training at the training center at the world headquarters of Delta Air Lines in Atlanta to experience first hand what to do when an airplane lands in water. The seat cushions aboard most airplanes can be used as flotation devices. If you are instructed to do so by a member of the flight crew and the airplane is not equipped with any other flotation devices, pull the cushion up from your seat; hold the cushion against your chest; and slip your arms within the straps under the seat cushion. Walk towards the exit of the airplane while holding the seat cushion tightly against you with your arms in the straps so that when you jump into the water, you do not lose it. Once you are in the water while still holding the seat cushion tightly, lean into it to stay afloat. You can also paddle your feet behind you if you need to move; but do so sparingly, as you should conserve your energy in case you need to use as much of it as possible to be rescued. Although seat cushions can be used as flotation devices, many airplanes are equipped with life vests — which are either located directly under your seat or on the side under your seat. It can be stored in either a soft pouch or a hard plastic case. When instructed to do so, reach under your seat and put the life vest on as instructed during the safety demonstration — and if you do not remember how to do it, not only are instructions with graphics usually printed on the life vests, but you will most likely receive audible detailed instructions from members of the flight crew. Whatever you do, ensure that you do not inflate your life vest while seated, as once they are inflated, their bulk could impede upon and obstruct other passengers from safely evacuating the aircraft. Another reason to not inflate your life vest while seated aboard the airplane is that if the airplane fills with water, passengers who have their life vests already inflated could risk floating to the top of the airplane, where they could potentially be trapped and not be able to escape — which is what reportedly happened aboard the Boeing 767-200ER airplane which operated as Ethiopian Airlines flight 961 after it was hijacked on the way from Addis Ababa to Nairobi on Saturday, November 23, 1996, which resulted in a crash landing on the water. 125 of the total of 175 people died because they inflated their life vests inside the aircraft and were trapped by rising water which filled the airplane and caused it to sink. After members of the flight crew open the exit doors, you will be instructed to head for the exit door which is nearest to where you are seated. Only when you reach the exit door can you then inflate your life vest; and only under the instructions of members of the flight crew. Notice how the life vests on passengers who are still aboard the airplane behind the woman who is jumping into the water are not yet inflated. 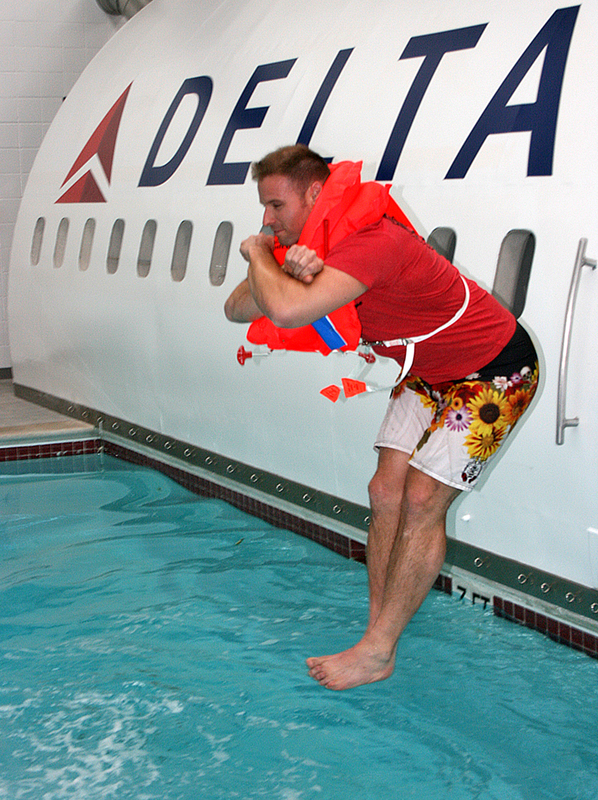 …and then jump into the water only when instructed to do so by a member of the flight crew, as he or she will tell the other passengers who are already in the water to move away from the exit door as quickly as possible so as to reduce the risk of the jumping passenger injuring anyone who is already in the water. When you jump into the water, do it as far away from the airplane as possible to mitigate the possibility of injuring yourself against the aircraft. Notice how the passengers who are already in the water are floating as far from the exit door as possible so that the remaining passengers aboard the airplane will have plenty of room to jump into the water. Once in the water, passengers are advised to come together and form small groups to increase buoyancy and to assist each other if necessary. Many airplanes are equipped with inflatable evacuation slides which can also double as rafts in case of a water ditching; and the following photographs will demonstrate how the rafts are inflated — even if they are not evacuation slides. In this example, a member of the flight crew will take an inflatable raft — which is packed and stored in a compact bundle — and place it by the exit door of the aircraft. Once the cord attached to it is secured, either one or more members of the flight crew will then throw the raft out into the water — or one or more passengers may be solicited to assist, depending on the situation. …to cause the raft to start to inflate on its own. …which is not a problem, as airplanes can usually stay afloat long enough for all passengers and members of the flight crew to safely evacuate and be rescued before the aircraft eventually sinks into the water. Once the raft is inflated, it is then pushed away from the exit door of the aircraft so that passengers and members of the flight crew can safely evacuate the airplane. Depending on the aircraft and the airline, inflatable rafts come in different sizes. In this case, this raft is also an inflatable slide, as per the instructions underneath it, which explain how to release the slide. …but they can also come in handy to turn the raft over right side up. Once the raft is right side up, the passengers can hold the handles to better steady it for when passengers board it from the water. …so the first person to board the inflatable raft should have enough upper body strength to pull himself or herself aboard. The water can add enough weight that even the assistance of others along the side of the raft may not be enough to help someone whose upper body is not strong enough. …to be able to lend a hand to other fellow passengers to board the inflatable raft from the water. Some passengers offer additional assistance to help others board the inflatable raft; while others hold on tightly to the handles on its sides. Using a larger inflatable raft is similar in many respects to using a smaller inflatable raft. Although doing so may be more difficult, boarding the larger inflatable raft is similar to the aforementioned instructions to boarding a smaller inflatable raft. …but on this inflatable raft, red handles are generously provided for passengers to also help themselves aboard so as not to unnecessarily sap the energy of the good Samaritan. …he or she should go as quickly as possible to the center of the inflatable raft so that room is available for the next passenger to board — or, if there is enough room, lend assistance to help other passengers board more quickly. For this particular inflatable raft, passengers can board from either end, as those passengers who have already boarded are seated as comfortably as possible in the center. This particular inflatable raft is equipped with red sticks. If you look carefully on the left side of the photograph, one of the red sticks is standing on its own as it is seated in a black base on the side of the raft. …and it is unfolded across the entire inflatable raft, with all occupants securing the tarp on the red sticks at designated locations on the tarp, which serves two purposes: to protect the passengers of the inflatable raft from adverse weather conditions; and also to collect drinkable water from rain. ..but although leaving belongings aboard an airplane during an evacuation may seem like simple common sense, why do passengers grab their belongings anyway? Several articles which I have read indicate that passengers may simply be used to retrieving their belongings when a plane lands — which seems to be common, no matter from what part of the world in which you are based — and people are automatically concerned about getting their luggage without thinking about the consequences. Members of the flight crew train rigorously for weeks at a time to prepare for what no one hopes is an eventual occurrence; and that training includes instructing harried passengers — some of who may be in shock. Could passengers also be too worried about recouping the value of their belongings from the airlines, as inferred by Ed I? Passengers seem to rarely listen to the safety announcements from either members of the flight crew or from a safety video prior to departure of the flight; and amongst the reasons could be complacency, boredom, disinterest — or all of those reasons combined. Airlines have attempted to ensure that their safety videos are more interesting and entertaining — but if they even watch the video, are passengers remembering what an actor did versus the actual message which the safety video is required to impart? Is the safety message coming across effectively — or have the safety videos failed in their primary purpose in general? Perhaps the perceived adversarial relationship between airlines and their customers may have a significant psychological role associated with this phenomenon, as passengers may very well automatically assume that airlines seem to do everything they can to “enhance” the overall experience to the point of it being as miserable, stressful and frustrating as possible in terms of cost, comfort and inconvenience. Why should they listen to — or trust — the words from an entity which does not seem to care about them, anyway?!? At least you now have an idea as to what should happen — as well as what you should do — to ensure that you survive the water ditching of an airplane, which you will likely never experience. …which begs the question: should passengers who evacuate airplanes with baggage during emergency situations be fined? Please be sure to read the comments of that article, which I wrote on Tuesday, February 20, 2018 — and i f you have not already done so, please also read this article pertaining to 5 reasons never to evacuate an airplane with your belongings. I think what might help is to do the safety instructions again after takeoff. There is a lot of preflight mental noise going on, dashing off that last minute phone call, email, etc so people just are flat not paying attention. Do the pre takeoff briefing of the most critical aspects and then do a more thorough one just after hitting 10K altitude. Maybe ditch the unnecessary weather announcements might increase passenger attention too!